Police are searching for a man wanted for a string of burglaries in Astoria and Long Island City that took place over the course of two weeks, resulting in more than $52,000 in stolen property. On March 12, around 1 p.m., the unidentified man entered an unlocked garage near 21st Street and 21st Avenue and made off the with 30-year-old resident’s Ducati motorcycle, valued at $3,000. Ten days later, on March 22, the man began a string of four burglaries in the same day. At some point between 1 a.m. and 9 a.m., the burglar entered into the garage of a residence belonging to a 42-year-old man by breaking the lock on the garage door. The resident returned home to find the lock broken, but nothing had been stolen, police said. At some point between 10:30 a.m. and 4:30 p.m., the man broke the lock on a first floor apartment inside a residential building near 76th Street and 20th Avenue, causing damage to the door. Once inside, the burglar then stole $44,000 worth of jewelry belonging to the 67-year-old resident, including diamond rings, tennis bracelets and two Cartier and Omega watches. 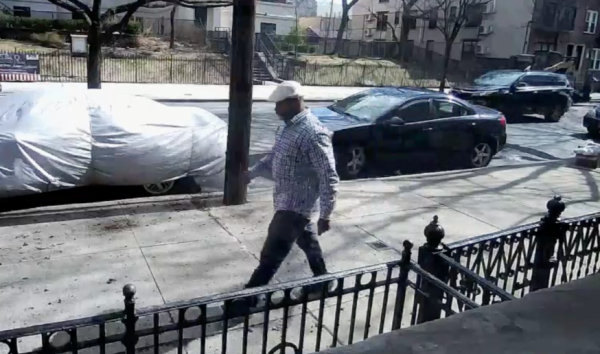 Within a similar time frame, the suspect hit a second residence in the vicinity of 76th Street and 20th Avenue by breaking the lock to a second-floor apartment belonging to a 30-year-old man. He made off with the victim’s MacBook Pro, jewelry, clothing and bottles of wine, totaling $5,540 in value. Moving to 41st Avenue and 22nd Street, the burglar again broke the lock on a second-floor apartment at some point between 8:45 a.m. and 8 p.m.. The 57-year-old woman who lives in the apartment came home from work to find her front door ajar, but no property had been stolen. Four days later, on March 26, the man broke the lock on the door of a garage near 45th Street and 21st Avenue some time after 9 p.m., and stole a bike valued at $200. The wanted man is described as black and between 45 and 50 years old. He was last seen wearing a white Kangol hat, plaid shirt and blue jeans, and was driving a maroon Ford Explorer. Is this twit really strutting around town in a light colored shirt and white felt driving cap? Really?? Yes there was more community back in the 70’s/80’s in Astoria. Neighbors and stoopsitters watched out for each other. However it was not Mayberry,USA. My house was broken into and all my jewelry stolen. One night someone tried to climb in my window. My garden was being used as a drug drop. People were getting mugged all the time and if it happened on our block the neighbors would run out and help the victim such as the woman who was hit over the head with a gun and robbed. One exciting night someone was shooting after another man running for his life and my neighbor got a bullet hole in her brand new shingl es. Etc. Etc. Ahh…the 70’s/80’s coming back again! This does not mean the 70’s/80’s are coming back. People glorify the past and don’t remember how bad it was because there was no internet to go back and check your social feed. This guy was a pro. Astoria is richer than any other time before it. If you are going to plan a detailed hit, you do it where the money is. Northern Astoria (Ditmars) was such a quiet, clean and safe family oriented neighborhood back then. It was a great place to raise children. People knew which areas to avoid late at night and where to be cautious during the day (like some places in southern Astoria by the factories). Today it does not matter, you have to watch yourself and your children where ever you live in Astoria with so many people roaming the streets for the restaurants, bars, etc. it is easier for criminals to blend in and prey on victims. I am glad I found a place in Astoria with a doorman. Where are the local politicians? Where is Gianaris, Simotas, Consantinidis and the rest of these politicians??? Those who are not working in that area, should load their weapon & wait for someone to break in & then kill him. =) BLAMMO! Not surprising its one of those people ruining my neighborhood. You mean Kangol wearing people? Is it me or is crime making a comeback in the Astoria area? It starting to feel like the 80’s/90’s again. With the Kangol, I would say early to mid 80s feel. IMO, the 80’s/90’s were fine in Astoria despite what was happening in other NYC neighborhoods. Back then residents/neighbors looked out for each other. Many felt safe enough to leave their front doors and windows opened during the day as children played outside. Nowadays many people are oblivious to their surroundings and some put their instincts aside for the sake of not offending. This allows criminals to roam the streets and enter homes because they know few will care or stop them. Astoria was multicultural in the 70s and 80s so I’m not sure what you are talking about. You must have been living in an alternate universe. During my time in elementary school at PS70 in the late seventies, there was one Indian kid, a handful of East Asians, and a smattering of Hispanics (mostly from Woodside). Oh and some black kids but they were mostly Queensbridge and Ravenswood bus children so they aren’t from what most consider Astoria proper. Otherwise, if you consider 90% of the student body being ethnic European multicultural, then hey I ain’t stoppin’ ya. Deblasio City!!! Even if the catch him tomorrow, Deblasio will release him the very next day.